Kayaking is a great activity to do with your friends and family to spend a sunny day on the water. The thing is though, kayaks are not exactly the cheapest things to buy and many of them take up a lot of room. That’s a lot of commitment for some summer paddling. Worse yet not everyone has a garage these days let alone rent out a space for something that you will be using in the summertime if you live in a colder location such as myself. The thing is though, kayaking can give you a lot of different health benefits. The solution? An inflatable kayak such as the Intex Explorer K2 It is the perfect family kayak to explore and paddle in for a few hours. Who is the Intex Explorer K2 for? The K2 is perfect for casual paddling in calmer waters such as lakes, bays and slow moving rivers. It can easily fit two adults that are under 200 lbs and a small child/ dog. It is also a great kayak for kids to paddle because it’s bright yellow color stands out from everything else which allows parents to see their children quite easily. The Explorer K2 will give you a bit of paddling ability and handles better than many inflatable rafts. It is also comprised of surprisingly durable material that can take a few scuffs from the bottom of the lake. Who is the Intex Explorer not for? The Intex Explorer K2 is not the ideal vessel for any sort of serious paddling. It’s biggest downside is it’s paddling ability. In other words do not go on long excursions on this kayak as it is simply not built for such. I also would not recommend taking this kayak in places where there is rough water or high tide/ low tide movement. I have a hard shell kayak and every time I paddle the Nicomekl river close to where I live I always have to keep a close eye on the tide. It is hard enough to paddle against the tide in a recreational kayak that probably close to impossible in an inflatable kayak like the K2. If you have been researching for long you would have noticed that I put the Intex Explorer K2 instead of the K2 Challenger. Why? Well for one the uplifted bow will keep the kayak high and dry in more “challenging” conditions. Two It’s reinforced Bow and Stern Covers help the kayak keep shape which allows you to also sit higher in the water to give you an upright paddling position. This will increase your paddling power all while increasing the kayaks speed. In a way this kayak can be described as the poor man’s Sea Eagle 330. Both have a similar shape but Sea Eagle has more thought out materials and design into their kayaks. Similar to the Intex Challenger K1 the Intex Explorer K2 features everything you need to start paddling including two paddles, a pump as well as two seats and bow and stern covers to help the boat keep shape. Compared to the K1 the Explorer K2 is uplifted so that it sticks out of the water. This is great for visibility but bad for windy days as wind likes to push inflatable kayaks that are uplifted. Unlike the K1 this kayak features a lot more space which is great if you want to go on any day trips. On water performance is good for the price. The tracking skeg definitely makes a big difference in terms of how the kayak handles so don’t forget it! While the Intex Explorer K2 Kayak can handle rougher conditions with good stability, paddling in it is quite another thing. It’s uplifted design as mentioned before can be a nuisance in windy conditions and you will not be going anywhere fast! If you have a family (or a dog) and you just want a calm paddle in a local lake or river the K2 is more suited for you. Similar to the Challenger K1 many customers appreciated the fact that this kayak was budget friendly all while providing a solid recreational kayak. Most of the positive reviews stated that fact in one way to another. A few others liked the fact that it takes only less than 10 minutes to set up the Intex Explorer K2. The higher up seating position of the Explorer K2 garnered it more positive reviews in terms of the seating position. 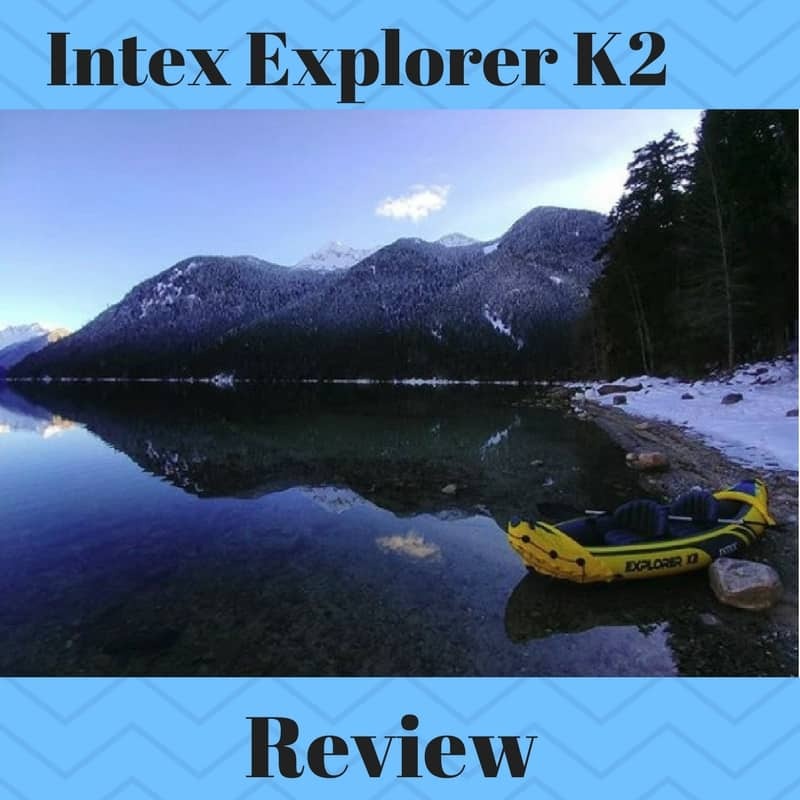 Many reviewers felt it was comfortable enough to take the Intex Explorer K2 on day trips. As with the Challenger K1 many people who bought this kayak were first time kayak owners. Overall this kayak did impress them for what they paid for it. 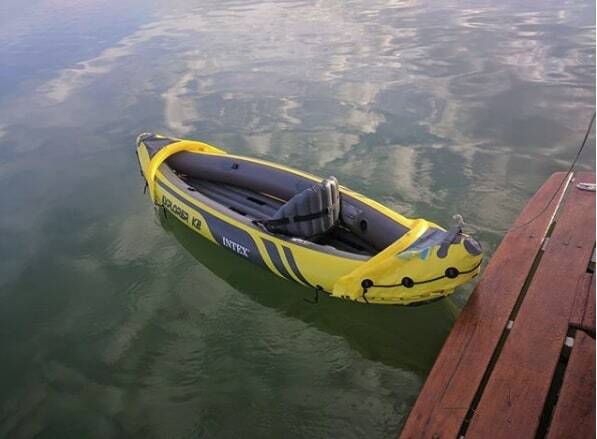 Many of the buyers that purchased this kayak were not very happy with the accessories that were included. Starting off they were impressed that Intex included them but as they got more use some things such as the oars or the pump would break. A few reviewers went on to say that the K2 Explorer was vulnerable to heat. That is if they kayak was a bit over inflated and left in the sun too long there would be a “POP”! This would be due to the black material overheating. Is the Intex K2 Explorer for me? You probably won’t like this answer much but it depends. The ideal situation to get the Intex K2 Explorer is if you want to use this as a first kayak and you want to paddle in calm lakes. It is also very family friendly and is a much better option than getting a blow up rowing dingy as it will paddle better and farther. It should be noted that if you plan on paddling and actually getting somewhere you should attach the skeg to it. The skeg will give the kayak far better tracking and paddling will be an easier task. Having said this if you have paddled a hard shell kayak before this will be a bit of a disappointment in terms of the paddling experience. Where this kayak does shine though is through durability. Almost guaranteed if you crash into something (not sharp) you will simply bounce off of it like nothing happened. In a hardhsell kayak you can potentially get scratches or even worse yet cracks. repair on hard shell materials is also more costly and time consuming as opposed to some patch work on an inflatable kayak. Very poor product in my opinion. On its first outing the seat attachment came permanently detached from the boat. We continued to use the boat with one person kneeling after this. On about the 5th outing a leak appeared at a seam on the inside of the boat. The puncture repair kit was inferior and did not fix this problem. I got around this by placing a wadding and water bottle jammed under the side to reduce the airflow outwards. Finally the side panel burst as there is no way to accurately see what the psi is of the boat. Now it is a useless item as I cannot get around this problem. Very dissatisfied. Thank you for sharing your experience, it seems with these cheaper kayaks it can go one way or another. Even though a lot of customer reviews are positive I did notice there were a bunch of people who complained about similar manufacturing defects. Did you try contacting the Manufacturer about this problem?